This time of year I always struggle to find my festive spirit. I know it must be down there somewhere. Everyone has a celebratory side, right? Mine must get lost amidst holiday card hand cramps and the stress of knowing I only have two weeks and I haven’t purchased a single thing. When I was a kid it was easy to be excited. I never understood why my mother always looked to the holidays with dread. Well, Mom, I get it now. And I am sorry. Reason #182 for why I should never have children. I find what helps the most is involvement. Kinda like Charlie Brown. I need to participate in holiday activities in order to kindle whatever flame may be lurking in my frazzled heart. If there is a play going on, I need to buy tickets. If there is an office Secret Santa game, I need to sign up. If there is a tree-lighting ceremony, I need to volunteer. The more things I do, hopefully the more I will feel the love. Yesterday on Vizsla Inspiration I read about a fantastic holiday photo contest put on by Life+Dog Magazine. It seems every Friday they run a small pet photo contest with a particular theme. Today’s theme is “Holiday Dogs”. But that’s not what interested me the most. 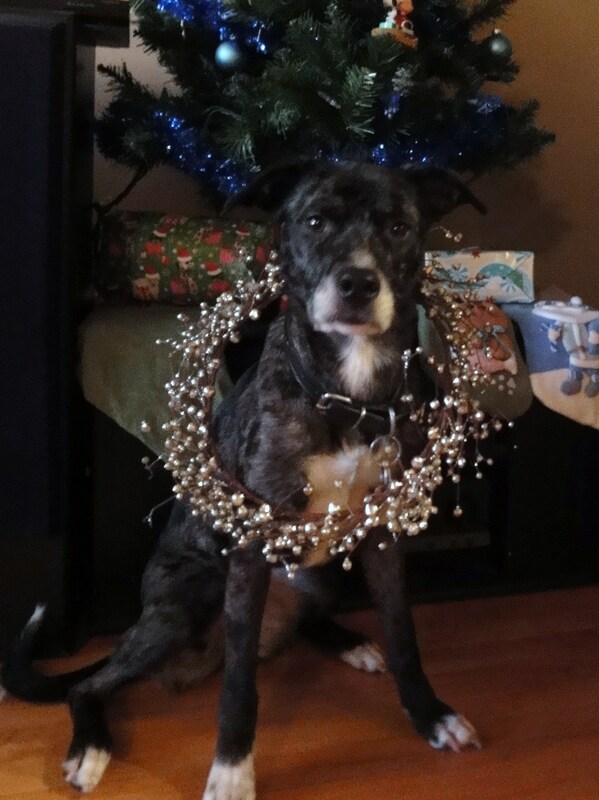 As part of IAMS Home For The Holidays campaign, IAMS is donating 100 Meals to homeless animals in need for every photo submitted to this week’s contest. Now that is the kind of thing that is guaranteed to help perk up my spirits! Cookies in hand, I once more conned Shiva into posing for me. It may not be professional quality, but it’s worth at least 100 meals. She looks so thrilled about it too. 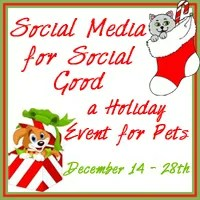 There is still time to enter and help homeless pets. Life+Dog will be accepting photos until midnight tonight. Check out their Facebook page to see the pictures already submitted. Some of the images have already given me the traditional warm-and-fuzzy feelings. Also, I have mentioned this before, Two Little Cavaliers has come up with a unique way of helping pets during the holidays. Called “Social Media for Social Good”, they are encouraging bloggers to sign up to promote their Facebook Fan Pages, Twitter links, and their Google+ pages for just $10 for all 3 links. The $10 will be divided 60/40. $6.00 will be given to the winner’s charity and $4.00 will be given toward the winner’s cash prize. It’s a super-fun way to combine holiday commercialism and animal welfare! Guaranteed Charlie Brown-approved. Hopefully I have helped others out there like me, suffering under the holiday blues. Even if the holiday spirit passes me by again this year, knowing I have done something to help animals in need prevents me from going total Grinch. The Whos will be safe from my wrath for another season. Thanks for sharing this! I meant to tell you that they will take submissions till midnight but you already figured that out. And I want to mention again to your readers that you DON’T need to friend them on facebook to enter. Just email them a photo of each dog in holiday costume and you are good to go. I like your photo, it was hard to do ours this year because our stuff is in storage. I still need to submit mine, not going for a win just want to get one in for the free meals. I understand completely how you are feeling. December has always been a hard month for me – even when I was a kid. The season of joy seems to find me very blue. I try to get out in the sun when ever I can – and I also do what I can to help others who are having a hard time. Shiva, you crack me up! Hi Kristine, my mom and dad aren’t really “human kid” kind of people either, they’re more “dog” people – so that’s why there’s a bunch of us here. Makes for a better home. My dad sent in a couple of photos so that IAMS will donate more meals for the furry kids who need food. Hopefully, these furry kids will all find a home;. That’s what we’d like them to have. Everybody wants to be wanted. And so Kristine, that’s what you already have with Shiva and your PH. Merry Christmas. Oh Sheevs, smile!! 😉 I find going away around Christmas time helps, but I am the antisocial type! That is a great picture! The contest is a good way to use a holiday photo too! I find that most of the time I am super excited about Christmas until it actually comes. By then the excitement as worn off. I guess I need to work on my Christmas spirit endurance! I taught Rugby to retrieve using a forced fetch. The retrieve class took 16 weeks all together to get the final product (retrieving random objects off lead) so if its taking a while that is probably pretty accurate. I’m not familiar with other methods, but I did read a series of posts over at Never Say Never Greyhounds that describes how she teaches her hounds to retrieve. Might be worth checking out. Hope it helps! Great photo, and great photo contest! We’ll have to check it out. I suspect I need a good dose of Christmas cheer, just like the Grinch got. I’d like to make next year a “giftless” Holiday for our family and instead focus on all the other parts of the season. PS – Love that wreath shot of Shiva!